Sometime ago a client came in inquiring about our correction services. 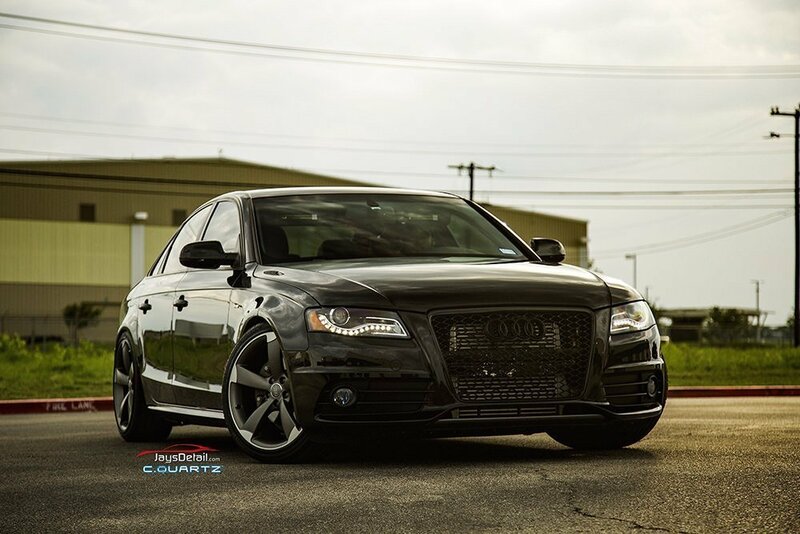 We set up an evaluation for the paint on a 2012 Audi S4 in Brilliant Black & we set up an appointment. 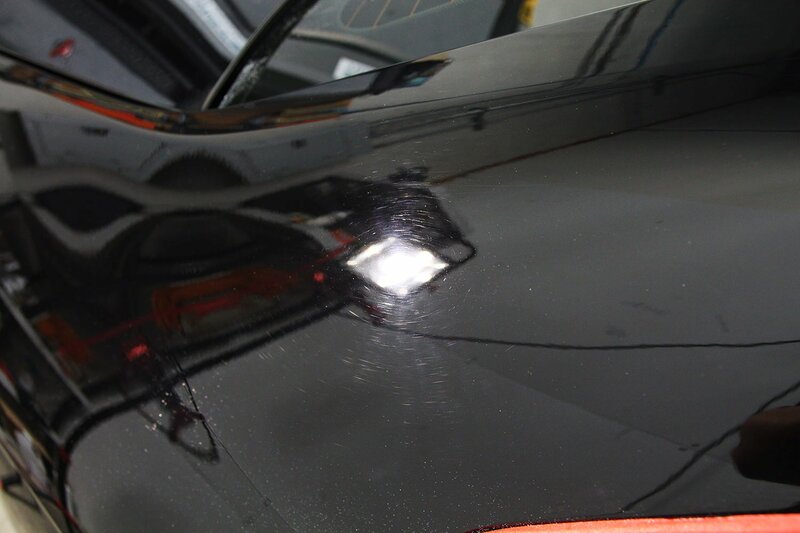 Our pre inspection before the wash revealed there was minimal scratching but a huge amount of refinishing that needed to be done to repair some of the repainted areas. 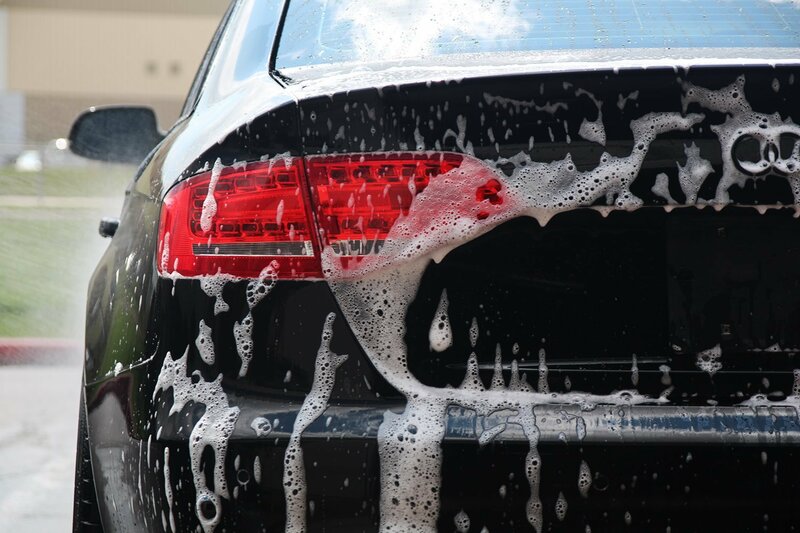 We start with a decon wash to remove any wax or sealants on the paint. The wheels get a deep cleaning along with door jambs and emblems. After the car get the decon wash we move on to a clay bar treatment to remove embedded contamination. Such as overspray, bonded dirt, industrial fallout and so on. 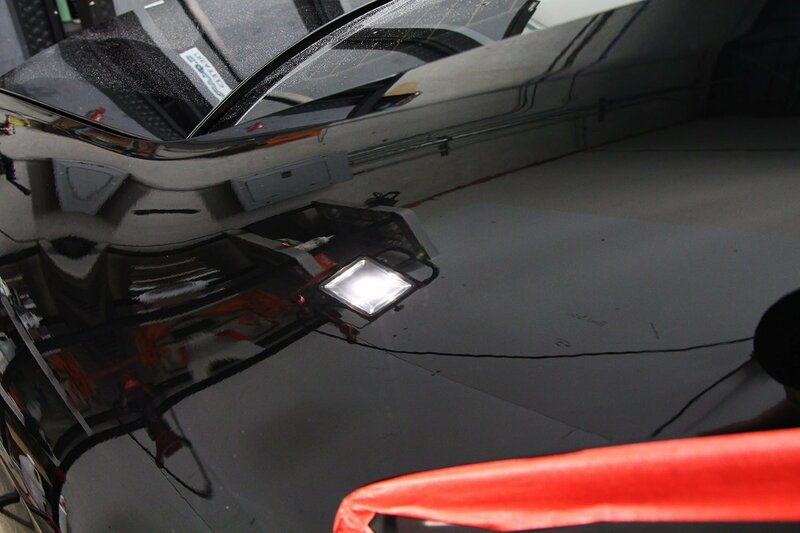 This will ensure that when we polish the surface is free of contamination and we can now focus on the defect removal. 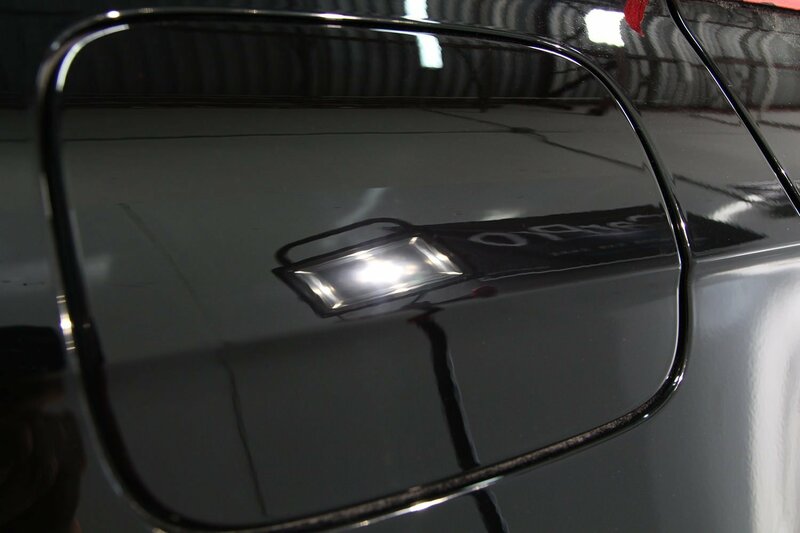 Under our intense selection of LED lighting, we can look for defects and determine which lighting will work best to show all the defects. This is what we found. below is an image of what appears to be an excessive amount of sanding marks. 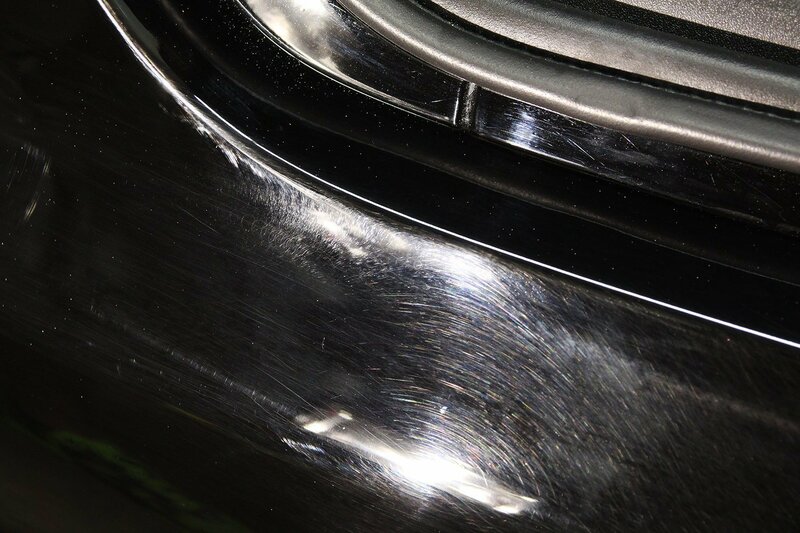 This usually appears when a section of sanding hasn’t been finished down w finer sanding and properly been polished out. This was found on various sections of the vehicle. 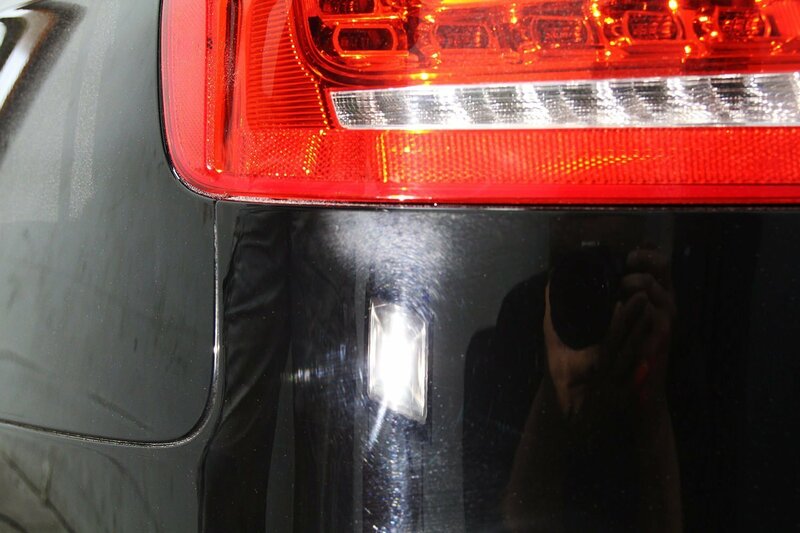 So we tested on the passenger fender area first w our correction process. 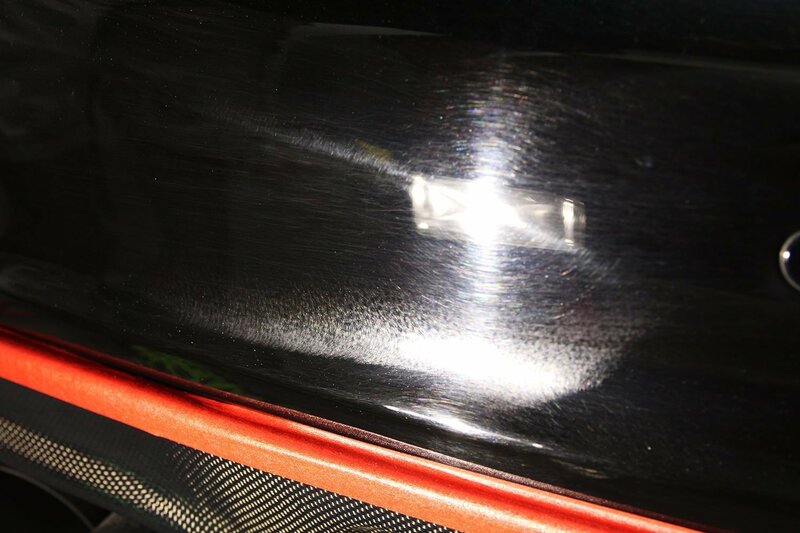 Below is the fender before. You can notice there are a couple of different type of defeat in this fender. 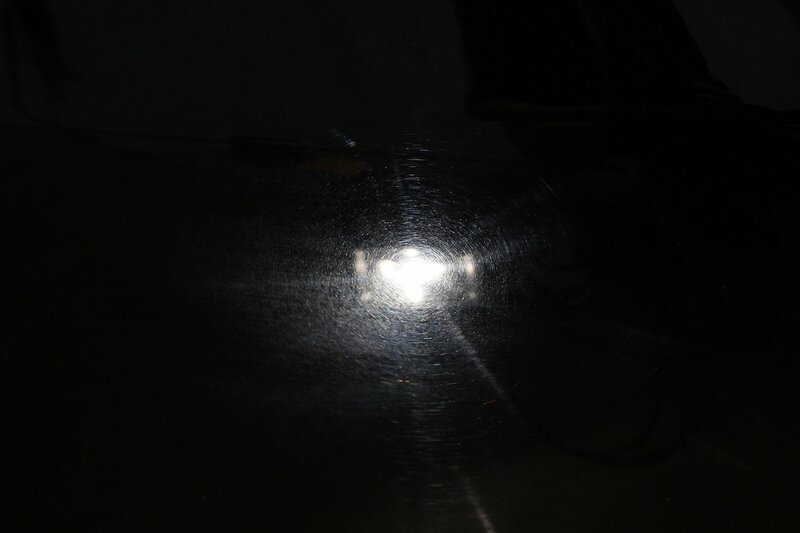 First there is some washing scratches that are faint, some buffer swirls right around where the led light. 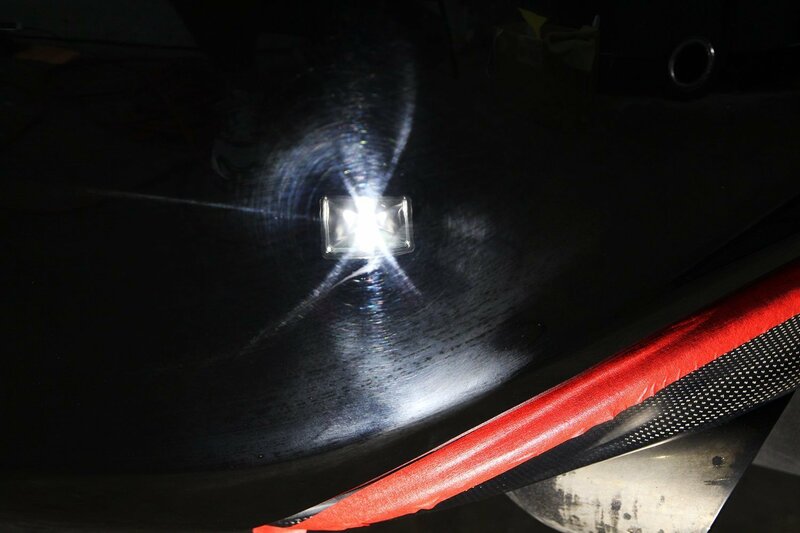 To the right of the top corner of the orange reflector in the lower portion of the body line there are fine DA sanding marks. 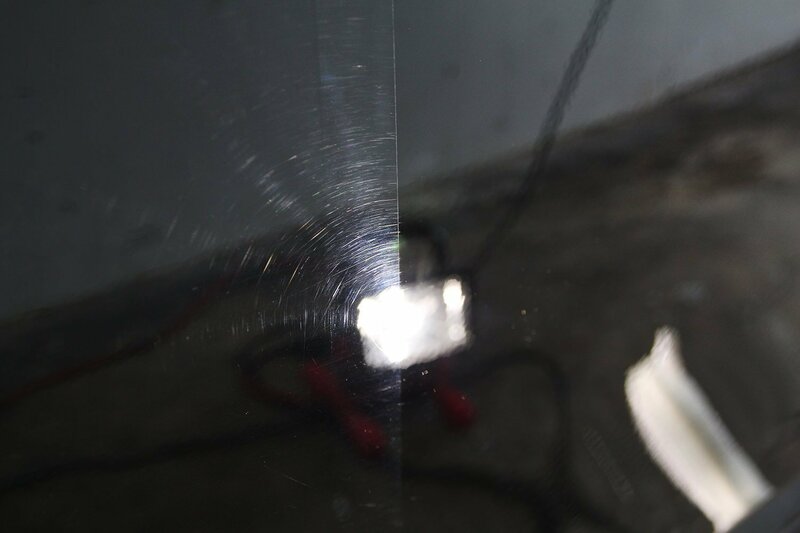 Being able to identify these defects allows us to determine what approach we will take to remove these defects safely with adding any additional damage. 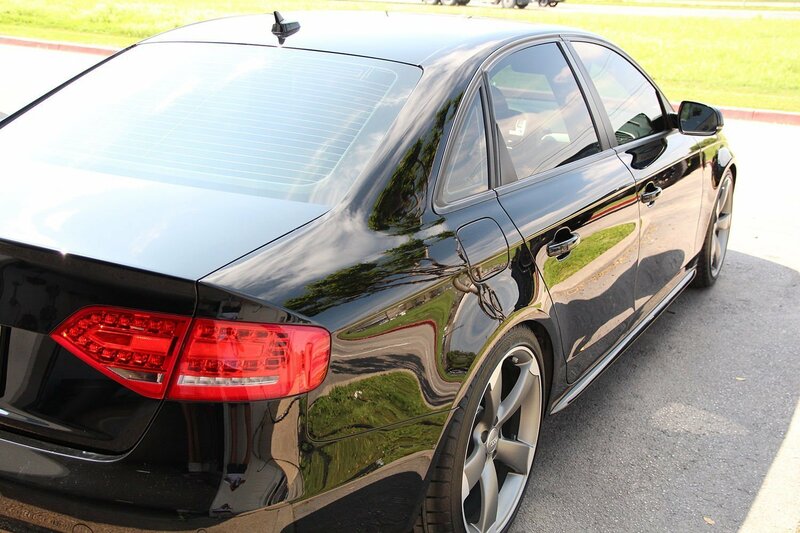 To see different types of defects that we come across daily you can see our Paint Correction Page. Once dialed in w our first initial step we have some progress. 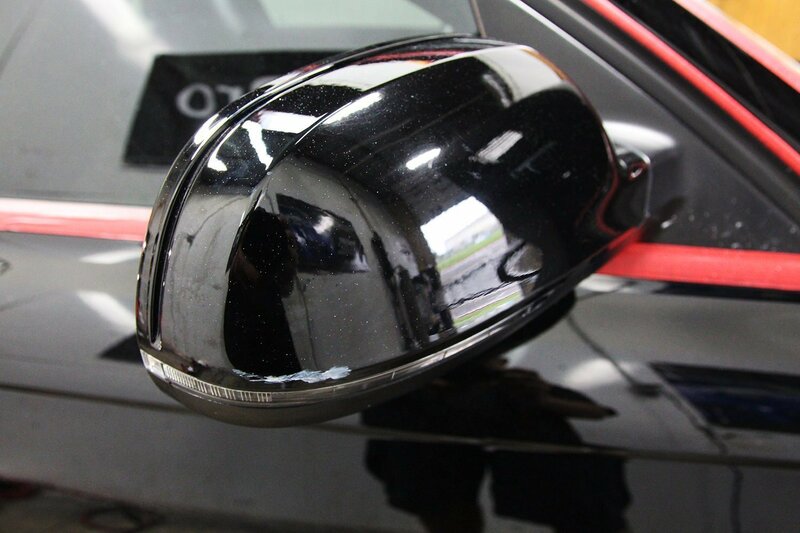 As we move down the passenger side the mirror had a bit of damage done to it as well. After a little polishing the paint transfer is gone. A little damage to the plastic still remains. But its a noticeable improvement. The doors didn’t have as much damage as the fender but some marring did stick out a bit. Here we have a 50/50 shot of the defects that are being removed. This paint should be deep, rich and wet, not dull, damaged & boring. 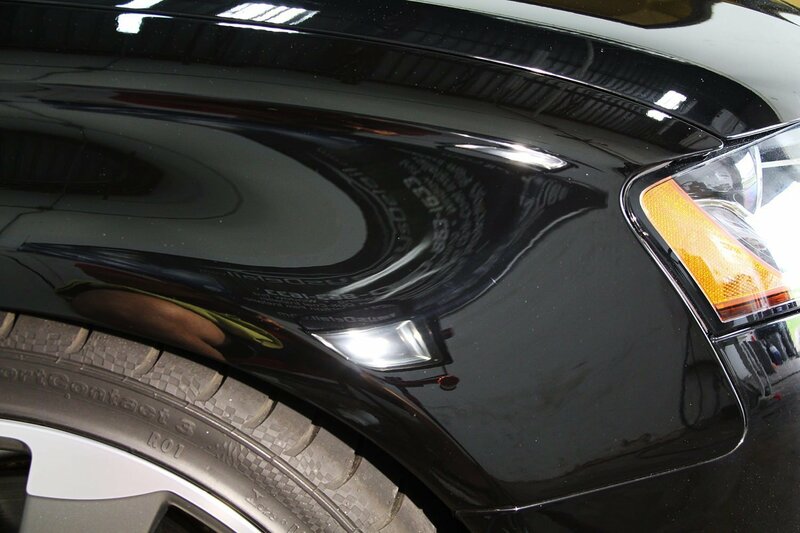 The rear quarter panels get some polishing treatment as well. Not too much damage here just your typical spider webs. An after shot shows that these spider webs were a breeze to remove. If there is one thing to notice is that when we demonstrate our correction process its in the same shot, at the same angle & with the same lighting. 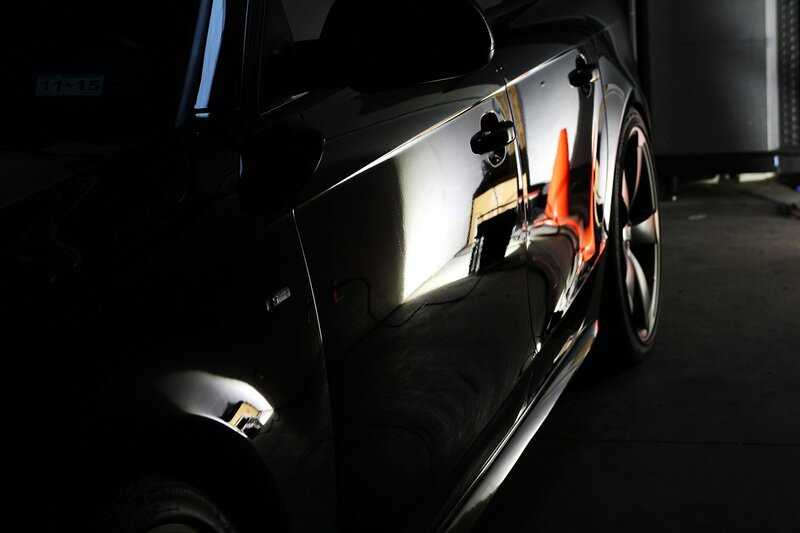 We strive to remove as much defects as possible. So displaying the complete process is crucial. Here is the gas cap before. Then the same gas cap after the defects were removed. 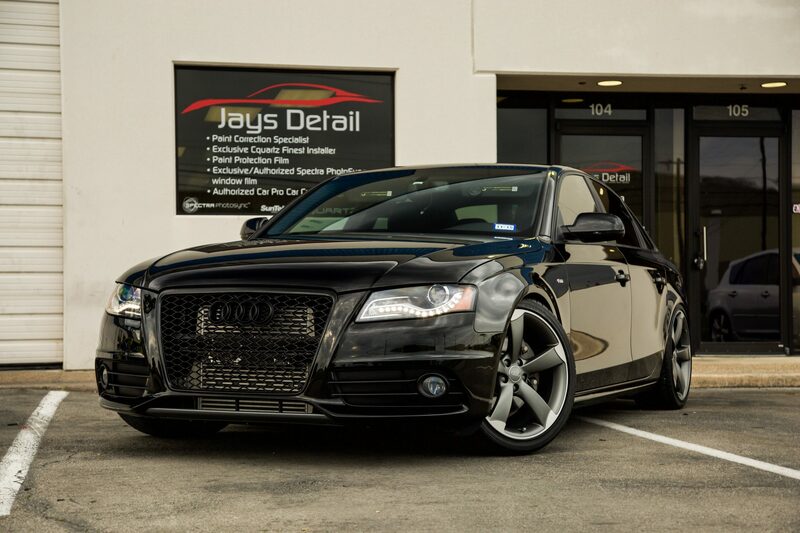 On the trunk we opted to remove the Audi logo and polish underneath it. This ensures a clean correction job. It took a bit of time to remove the logo, the glue that was left behind correct it and get it to finish down flawlessly. 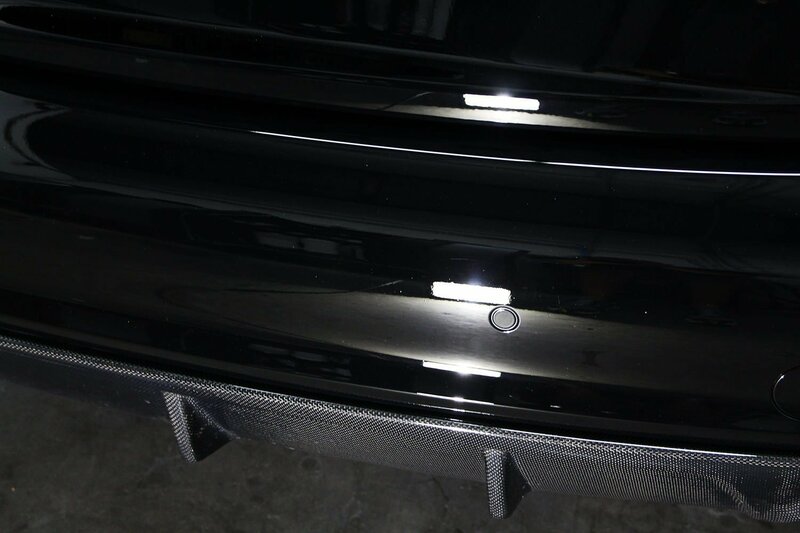 If you notice we also removed the license plate bracket and polished underneath that as well. Even though the bracket is going to go back on. This how we properly polish the paint on clients cars. 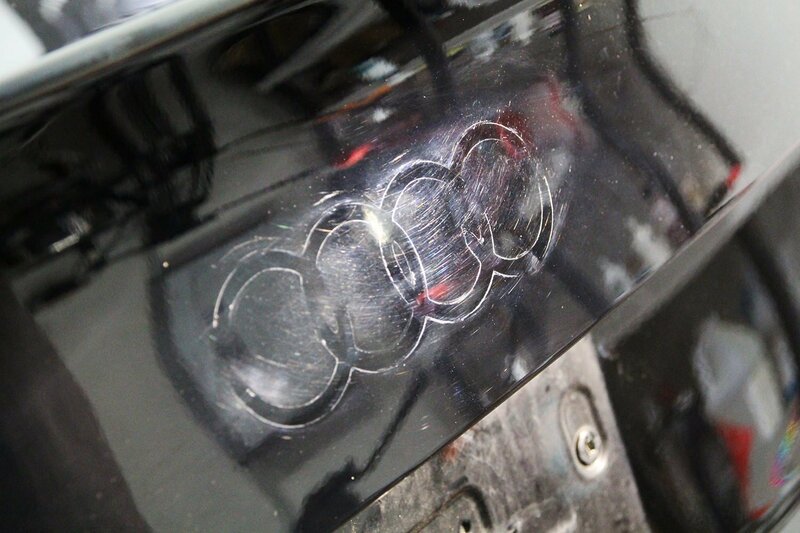 The rear bumper was where we found more defects than anywhere else on the car. Sanding marks and pig tails were riddled all over this poor thing. After hours of chasing sanding marks, pig tails and refining some of the deep sanding marks that were on this rear bumper. We end up with a corrected bumper like this. 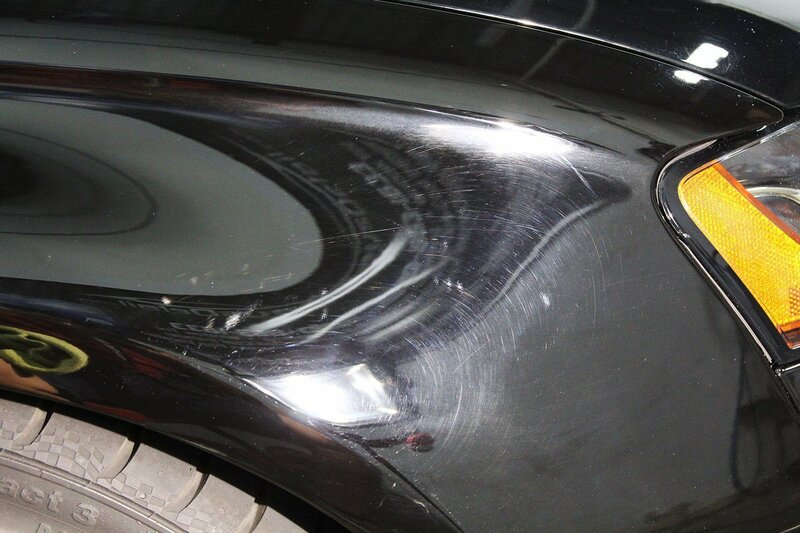 This is corrected only, at this point we haven’t even started the finish polishing yet. 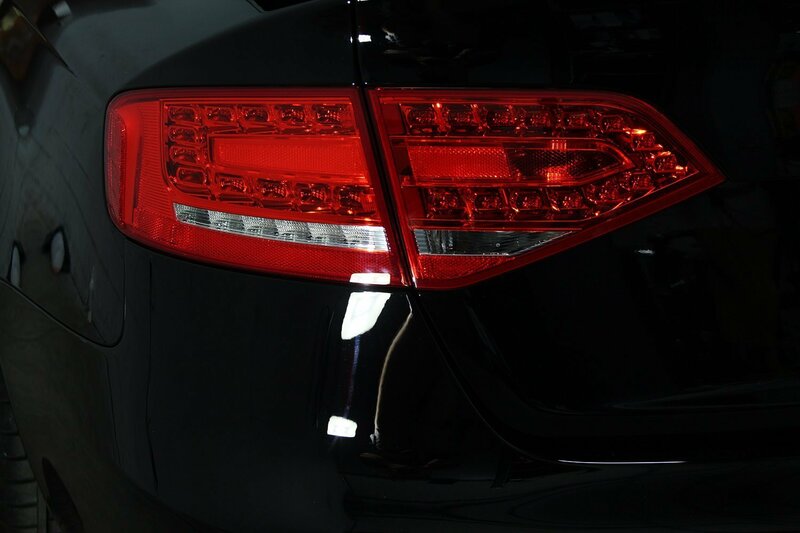 Once the correction process was complete, we started the finishing process with a fine finishing polish. 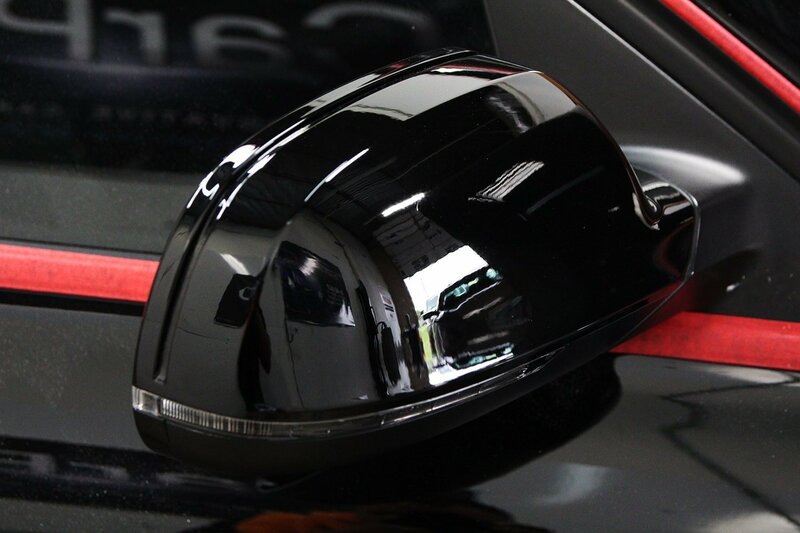 To bring out the depth and gloss of this black paint. Finally before we apply our paint coating we will go over it with an oil and polish remover. 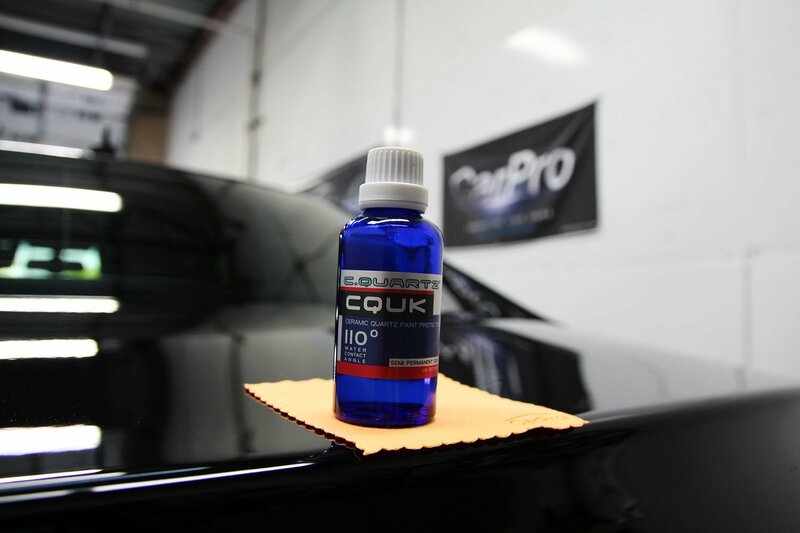 This ensures the correction and polishing process doesn’t fill in the micro fine scratches in the paint and that we have a swirl & defect free finish ready to coat. Late night and finished up. 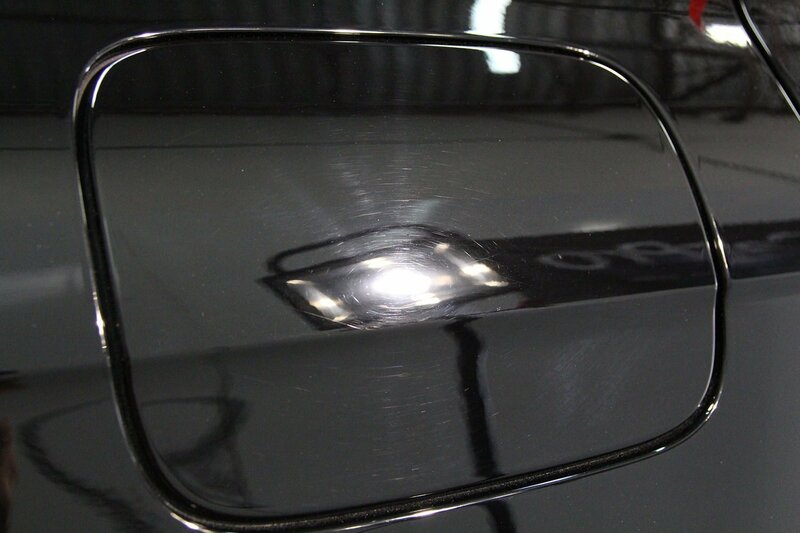 The choice of coating for this client was our C.Quartz UK edition coating. 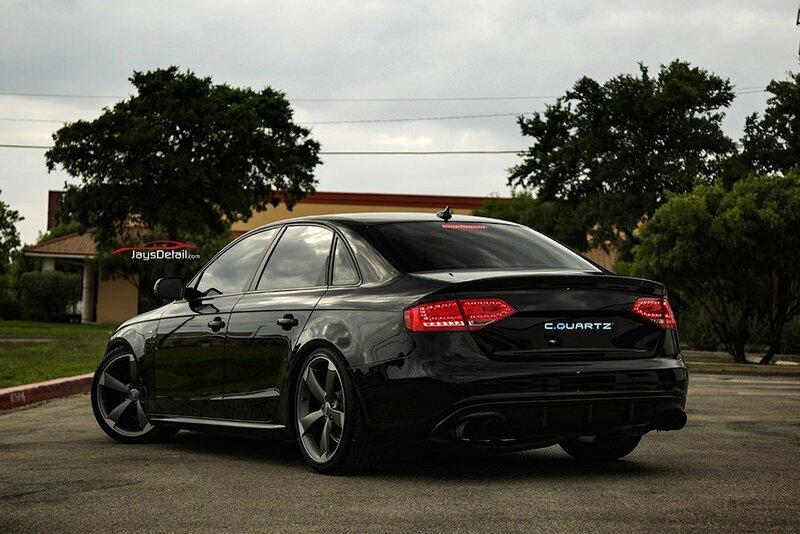 We are the ONLY authorized installer of C.Quartz ceramic paint coatings! The coating process will take approximately 2-4 hours. 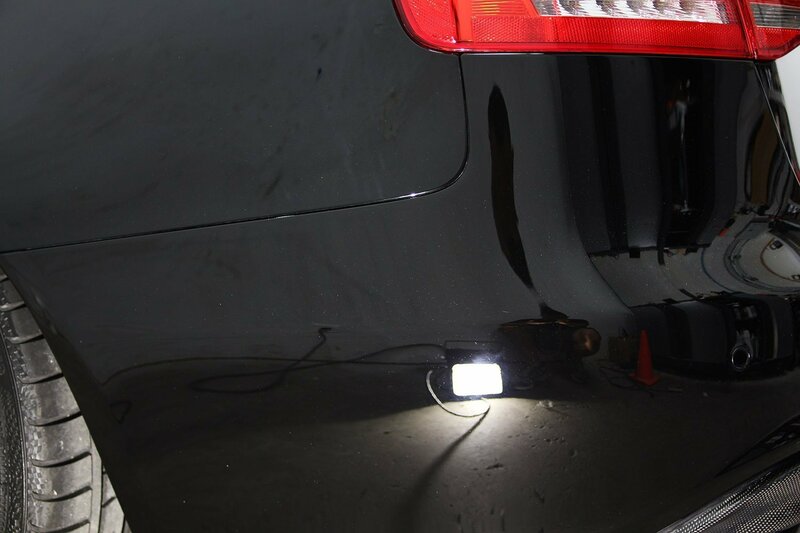 This is followed up by a Infra Red curing lamp to increase the cure time, hardness and increases gloss. 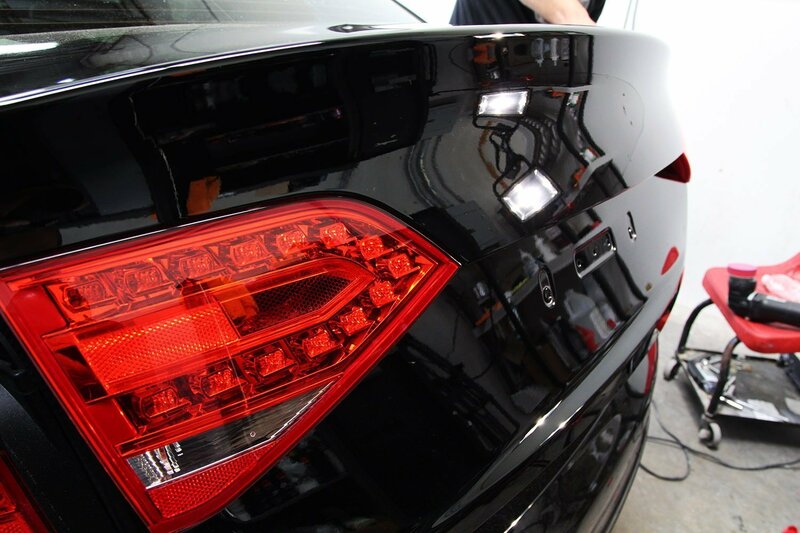 by the time this was complete it was really late & we were on some time constraints to finish the car for the client. We did however get some out side shots the following day. very nice work. you really know your work (passion)… i have a 2008 C6 vette (artic white) that i bought for my wife as a birthday gift, 2 years ago. It looked show room bright white then. not anymore. i was originally looking to get only the engine detailed, but after seeing your awesome work . i would like an estimate on the body also. Thank you for your time, Ray C.